CV addressable or clocked switch with inbuilt clock divider. Four independent switches, right side is normalled. Switches are symmetric so input equals output (can be used for distributing one audio/CV to up four destinations or switch up 4 sources to one output). Most common (normalled) jack is top jack on right side (normalling marking shows distributing one – most top – input to four – left – outputs). Division ratio can be set in range 1 (every input clock make movement to next channel) to 8 (moves to next channel after 8 input clocks). CV input (or manual knob setting) has priority and determines lowest channel too. 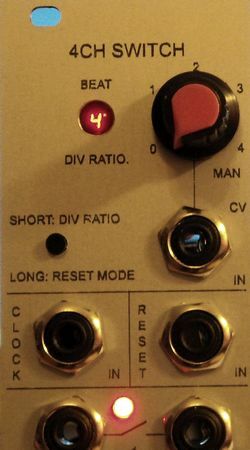 For example if knob (without input CV connected) is set to “3” switch will move between ch3 and ch4 only (2 sources or 2 destinations). Knob is working as input attenuator for input CV. 0-1V input switch allachannels off, 1-2V = ch1 on, 2-3V = ch2 on, 3-4V = ch3 on, 4-5V = ch4 on (all other channels off) if knob is fully CW. Just one channel can be on (or all can be switched off). Clock divider is set by knob: first push shows current division ratio (with dot point on), next pushes (within an second) changes division ratio upwards (1-8). If no second pus is made division ratio remains unchanged and display shows current tick count. Holding button for about 5s will change reset mode to “last step before first step” or to “first step”.